The new solution replaces a legacy CRM system, supporting 300 specialty sales reps across product lines. 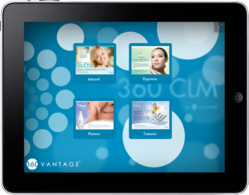 360 Vantage®, a leader in cloud-based sales and marketing technology solutions for the Life Sciences industry, announced today its agreement with a specialty pharmaceutical company for its cloud-based mobile CRM (360 CRM™) and Closed Loop Marketing (360 CLM™) systems. The 360 Vantage solution replaces a legacy CRM system and supports approximately 300 specialty sales reps across the Company’s product lines, as well as the marketing and management teams. The Company selected 360 Vantage based on their full service, partnership approach, and their ability to provide an integrated system designed to fit all of the Company’s requirements. The Company also based their selection on 360 Vantage’s expertise in Salesforce.com, its data exchange and management services (360 DX™) and its mobile platform (360 Mobile™) expertise. Delivered as a cloud-based service via laptops and the iPad, the integrated system gives sales reps user-friendly access to accurate, real-time customer data, market intelligence and reporting. The company will also be able to distribute and track marketing assets and sales aids delivered on the iPad to improve their effectiveness in the field and reduce print production costs. The fully integrated system launched at the end of Q1 2012. Established in 2005 and headquartered in Chandler, Arizona, 360 Vantage® is a leader in cloud-based mobile sales and marketing systems designed to solve the more complex front office challenges in Life Sciences, Healthcare and other industries. The company offers a full suite of professional and managed services in addition to its 360 CRM™, 360 CLM™, e-Learning and compliance solutions. Built on the Force.com platform and Salesforce.com, systems are designed to empower the mobile sales force and marketing teams with anytime, anywhere access to customer data and sales aids – from any device – giving the organization a distinct competitive advantage. The company CEO and founder, Mario Martinez II, is a Life Sciences sales and marketing technology veteran and can be found on the company blog, Twitter @360Vantage or @360CEO, LinkedIn, Google+ and Facebook. For more information, visit http://www.360vantage.com.